The Southland was a wood ~1521 gross ton steam-powered freighter that was burned and then scuttled near the dumping grounds off Cohasset. Our research is ongoing, but the Southland, formerly the Sarah Weems, was built in 1917 in Solomons, MD as part of the emergency fleet corp during WWI where she was used to transport passengers. She was reported to have sank several miles off Minot’s Ledge near Scituate, MA. 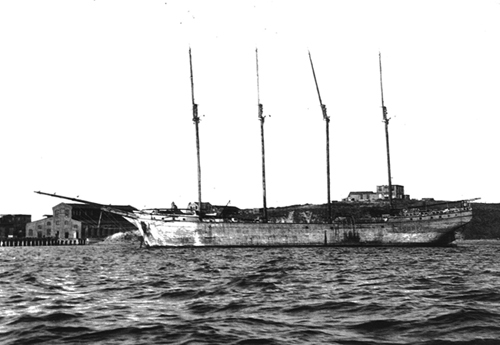 The Southland is a very large wreck at 205′ in length. In our research, we ran across another date of sinking: May 25, 1933; however the correct date is most likely that which was reported through the First Naval District Headquarters wreck list – December 2, 1930. The wreck sits in 160 feet of water and is semi-intact. We discovered one very large boiler on the wreck, which easily had 12-15 feet of relief. Other areas are flattened out with the vessel’s ribs showing. It appears the Southland was badly damaged at the time of sinking and the 74 years that have passed since then has resulted in further deterioration. The wreck appears almost as if the hull collapsed outward. On our initial dives we found ourselves in the stern of the wreck, as a large shaft is visible leading to the end of the wreck. The wreck may have more superstructure further forward, but with the exception of an enormous boiler and a three cylinder triple expansion steam engine, we did not observe a much structure. A very large dragger net is snarled on the propeller – reaching about 25 feet up into the water column. In low visibility it can be easy to become disoriented here in the less intact portions of the wreck.